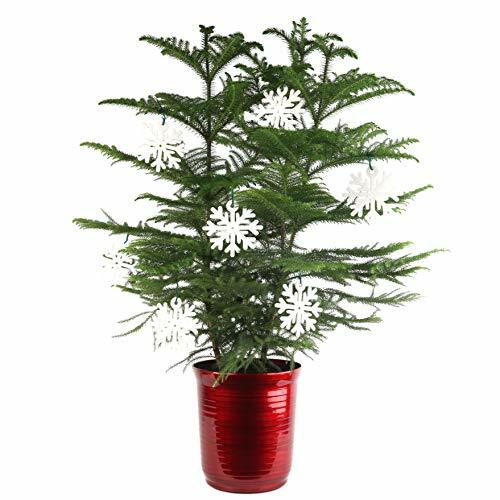 Let the holiday spirit grow throughout the year with this large-sized, 3 foot tall Norfolk Island Pine from Costa Farms. Great as a gift or for your own home, Norfolk Island Pines feature feathery, pine needle-like leaves that work to purify the air all year long. A seasonal centerpiece that's ideal for smaller spaces, The Norfolk Island Pine tree (Araucaria heterophylla) is great for decorating as a Christmas tree. These two small trees come with ornaments, preformed gift wrap, & a small amount of plant-safe glitter to start your holiday decorating. With time, The Norfolk Island Pine can grow into a stately tree that will add elegance to your home or office All year round. Small, young Norfolk Island Pines are ideal for decorating mantels, tabletops, & desks, while medium & Large plants are great for filling bright corners, flanking furniture, or as a stunning standalone focal pt.. An ideal choice for beginners, this easy-care tropical houseplant thrives with only regular watering & medium light. Native to the South Pacific, this tropical plant is not cold hardy & will not tolerate temperatures below 35° F (1° C). when shipped, the large size measures 3' Tall. Grown by Costa Farms, a family-owned farm based in Miami, Florida that grows more than 1, 000 varieties of high-quality plants for in & around your home. Costa Farms plants are not intended for human or animal consumption. Keep out of reach of children & pets. Decorated with its very own Red planter and White snowflake ornaments to start your decorating!